Calamus SL2006 ships with a 186 pages manual addendum for the SL2003 Complete Manual. If you do not have this Complete Manual already, you can purchase it at any time for only 49 EUR. As an alternative to the printed manual, we do not only offer the HTML version of the Complete Manual but also all available Calamus SL Manuals in PDF format for download. 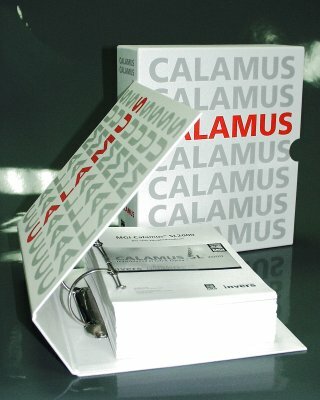 You can purchase all manuals and manual addendums in printed form (page collections, b&w print, DIN A5, 80 g/qm paper, ready for our Calamus A5 Slipcase Folder). Please find the prices listed below. We recommend the uptodate SL2006 Complete Manual with 818 pages, a new folder and slipcase for only 49 EUR. The old and well-known Calamus manual registers are out of stock. Here you find the PDF manuals. SL-2006-Compleet-gebruiksaanwijzing incl. ringband en ringband-index. Ideaal voor de aanvullingen van de gebruiksaanwijzing met de vele aankoop modules.